War Eagle! We’re here to serve you on game day, or any other day. 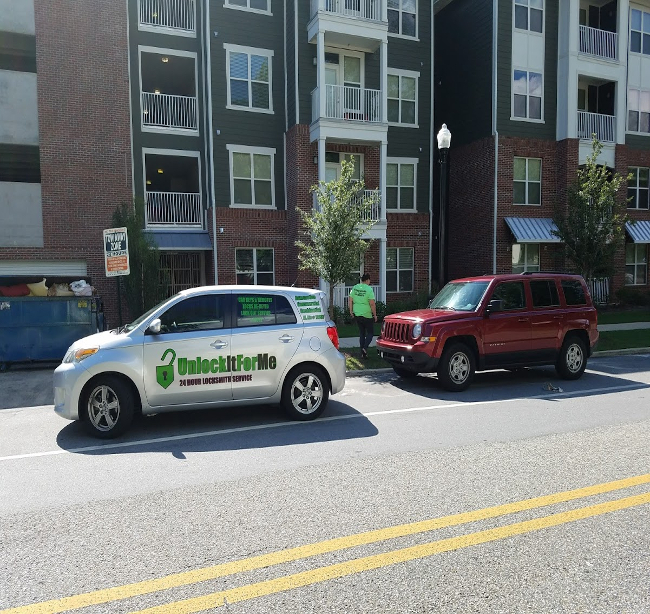 Our mobile locksmith service in Auburn, AL can typically be at your home or vehicle in as little as 30 minutes to quickly get your door unlocked at a low flat rate and without any damage to your property. In addition to lockout services, our Auburn locksmiths can also cut and program modern transponder keys, as well as many “dealer only” keys. We also offer residential lock re-key service. We have the skills and tools required to cut and program transponder keys to virtually all makes & models of vehicles. If you have lost your keys in Auburn, AL and are looking for a way to replace them, you’ve found it. With our on-site locksmith service, there is no need to have the vehicle towed to the dealership to pay exorbitant fees for what amounts to a simple task. As with most goods, the more hands a product passes through, the more markup is added on. With Unlock it For Me, you get access to low prices with no middle man mark up or retail charges. Don’t be fooled by the hype and marketing, the dealer is not the only place to get a replacement car key. It is most definitely not the cheapest. Auburn is the largest city in the eastern metropolitan area of Alabama United States. It lies in the Western Lee County and is bordered by the town of Opelika to the Northeast and by Chambers County to the North. It is the largest city in eastern Alabama and is home to Auburn University, Alabama's largest university. The city is served by three principal highways: Interstate 85, U.S. Route 29, and U.S. Route 280. It is the fastest growing metropolitan area in Alabama and the nineteenth fastest-growing metro area in the United States since 1990. In 2009, Auburn was ranked among top ten lists of best places to live in the United States by U.S. News. The city took it official nickname “Sweet Auburn, the Loveliest Village on the Plains,” from a line from Oliver Goldsmith’s the poem The Deserted Village. The city's financial system centers on Auburn University. Auburn long formed one of the most valuable industrial complexes in Maine. Auburn's industrial base is built around mid-sized, high-tech manufacturing and research firms. Auburn has one industrial park and four technology parks where main areas of industrial focus are on the manufacture of small engines, automotive wheels, fuel cells, plastic injection technology, and vehicle armor. Auburn is the home to the Jule Collins Smith Museum of Fine Art. The Smith Museum maintains a collection of mostly 19th- and 20th-century American and European art. Also in Auburn is the Telfair Peet Theatre, which performs a series of plays and musicals each year. Dozens of orchestras are performed by the Auburn Community Orchestra, as well as the bands of Auburn University and the Auburn High School yearly including a series of outdoor concerts in the fall at Kiesel Park. The Auburn Knights Orchestra, a big band jazz orchestra, and the Sundilla Acoustic Concert Series are other musical series in Aurbon. It is widely rumored that the theatre is haunted by a ghost named Sydney, who the Theatre Department appeases before every performance with a package of Reese's Pieces. There are some dance schools in the city that give classes in a variety of dance styles, such as ballet, jazz, hip-hop, ballroom, and even Irish dancing, which is supported by the Drake School of Irish Dance. Just moved into a new property in Auburn, AL or the surrounding area? Our team of locksmiths can come to your property and re-key the locks to ensure you are the only key holder, and that all of your locks are functioning properly and in good condition. We can upgrade or replace damaged or worn hardware with more modern high-security locks to protect your loved ones and valuables. Have a lock that you don’t have a key to? We can fix that. Two keys to open your front door? We can correct that! We can key your locks so that you have 1 key that operates all the locks in your home, or your locks can be keyed differently to offer privacy or security in a certain area of the home while allowing ease of access for the family members. We also serve Loachapoka, Beauregard, Shorter, Notasulga, The Bottle, Salem, Maryrn, Tuskegee, Valley and Smith’s Station with the same services mentioned above. We are willing to go the extra mile to provide excellent customer service in all our service areas.